Atlantis Lite is a free Bootstrap 4 HTML5 admin dashboard template. It comprises with latest features and asstes, for example- panels, avatars, buttons, notifications, pricing table, cards, charts, etc. Besides, Atlantis Lite has multiple colors to change the background of layouts form the color changing scheme. 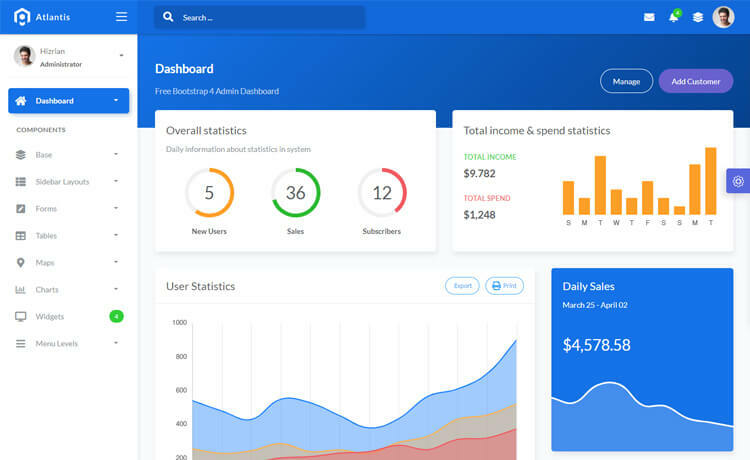 Atlantis Lite is a free Bootstrap 4 HTML5 admin dashboard template. It has two different color dashboard styles and four unique sidebar styles. Moreover, Atlantis Lite is a responsive dashboard template based on the Grid system. It also has a clean, minimal and beautiful design with sophisticated UI layouts. Atlantis Lite comprises with latest features and asstes, for example- panels, avatars, buttons, notifications, pricing table, cards, charts, etc. Besides, Atlantis Lite has multiple colors to change the background of layouts form the color changing scheme. Atlantis Lite is a modern and tech-savvy admin dashboard template to start your project with. Start your project with Atlantis Lite and explore more! Thank you for downloading Atlantis Lite. Here are three recommended free Bootstrap 4 HTML5 admin dashboard templates for you. This template is nice and clean, I really like this style.